by Albert Tablante, Information Literacy Instructor at ASA Institute of Business & Computer Technology. The first speaker of the day was Brett Bobley, the Chief Information Officer for the National Endowment for the Humanities. The title of the talk was Some Thoughts on Libraries and the Digital Humanities in an Open Access Context. Brett Bobley has conducted multiple discourses and interviews on Open Access. In this initial presentation of the day, Bobley demonstrated his knowledge and enthusiasm for the topic. In his introductory remarks Bobley explained that he would be speaking from the perspective of a person who grants funds to digital libraries in relation to humanities. This gave some insight on what types of initiatives get funded along with the finer points of pitching a proposal. The presentation was based on four main ideas: open data in the humanities, academic libraries and data management, libraries as partners in the digital humanities, and electronic monographs in the humanities. In discussing open data in the humanities, Bobley used many examples from experience. He showed cases of how open source systems have facilitated learning and scholarship, within and beyond individual academic disciplines. For instance, he explained how papyrology (the study of ancient writing on papyrus) and epigraphy (the study of ancient inscriptions on stone, metal, and ceramics) are benefiting from open access sources. The EpiDoc Project, an open source site, is allowing scholars to use information to share, combine, and build in ways that were not previously possible. 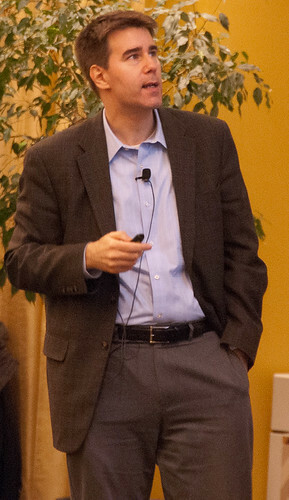 When discussing academic libraries and data management, Bobley examined this topic in relation to his position at the NEH. He provided some particular recommendations for an acceptable grant proposal, such as: submitting a sustainability plan that defines long-term support for the project, as well as a data management plan detailing how the research will be preserved. Bobley gave examples of successful proposals that the NEH has funded. Satisfactory data management plans included: data and metadata formats, data storage and security, and the role of the university or institution. Bobley next discussed examples of mutually beneficial partnerships between the libraries and the digital humanities. HathiTrust was an interesting example of an open source repository. This easily accessible information would not be available without the cooperation of many universities and Google Books. Finally, Bobley discussed the future of the “first book” in academia. He accentuated the traditional publishing of a scholar’s first book as a necessary part of the tenure process. Because book sales are declining, so are publication opportunities for scholars. This would make it difficult for new faculty to receive the credentials for promotion. Bobley proposed digital and open source alternatives for this academic tradition. This entry was posted in 2014Symp and tagged 2014 Symposium by Derek Stadler. Bookmark the permalink.